Lately it seems that there aren't enough drummers who are stepping out of the shadows as leaders. 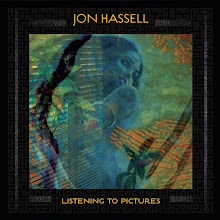 Sure you may have your Brian Blades, Jeff Tain Watts and Tomasz Stronen's over the last two decades to make some exciting albums as leaders but extending that list doesn't go that far (I know I'm not including probably another twenty...but you get the point). So when I was listening to the debut from Adam Cruz, Milestone (Sunnyside) I was giddy with anticipation. Adam Cruz has played with a plethora of musicians over the last two decades including Chick Corea, Sam Newsome, Tom Harrell and most notably with David Sanchez. Here was a consummate sideman finally after almost two decades getting the chance to lead his own group on record. Milestone is an superb debut in both composition and execution. 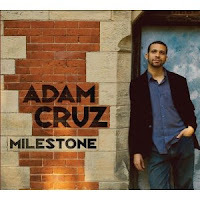 Adam Cruz has delivers similar results that Billy Higgins delivered on his all too few solo albums as leader. Milestone moves from straight-ahead contemporary with the "Secret Life" to more complex and adventurous material like "The Gadfly" and "Magic Leader" where Cruz really shines with some bristling palpitations on the drums. "Bird Of Paradise" a midtempo number which actually closes the album is a highlight for me in that it showcases the bands at full stretch romantically. Ben Street and Steve Cardenas add beautiful touches on their solos giving the piece a powerful resonance. Edward Simon and Cruz intertwine in time magnificently drawing small comparisons to the Billy Higgins/Cedar Walton. "Crepuscular" is a great piece with an ethereal tonal structure, slow building with almost Abercombie-esque passages from Cardenas deep in the background. "Crepuscular" rising on slightly towards to the end as Steve Wilson and Chris Potter push through with some powerful harmonics making the closing highly rich and expressive. Arguably just as inventive but certainly more upbeat than Brian Blades debut (no, I'm not criticizing Blades' debut), Adam Cruz has created a well rounded and dynamic recording that spreads across varying tempos and themes. It's a great piece work feature a an array of stellar individual performances. Cruz sets forth on some very expressive and expansive structures making Milestone a highly rewarding purchase for every jazz fan.